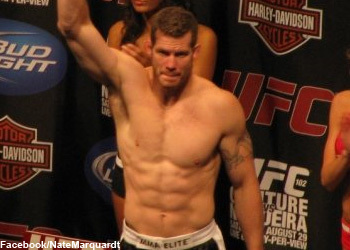 Middleweight Nate Marquardt is widely regarded as one of MMA’s most intelligent athletes. So it shouldn’t surprise anyone that he masterminded his “UFC Fight Night 22” strategy for Brazilian jiu jitsu ace Rousimar Palhares within a matter of nanoseconds. “It makes the game plan very easy,” Marquardt told 5thRound.com of his canvas or bust opponent. “Obviously, he’s going to try to get me down and catch me in some kind of submission. Whether it’s an armbar or ankle lock, I have to be able to defend those positions, as well as not get there in the first place. Palhares holds a respectable 11-2 professional mark and has ended eight of his wins via tapout, so his blueprint can be read clearly with braille. Although the Brazilian’s game is as one-dimensional as they come, the former top contender certainly isn’t petrified to enter Palhares’ planet. This is a critical scrap for Marquardt, as he’s looking to permanently erase the nightmare that was UFC 109 from his memory bank. With a shot at Anderson Silva’s middleweight crown on the line, the 185-pound stud laid an egg. While the landslide unanimous decision loss wasn’t what he was hoping for, it has helped fuel his fire to make another run at the brass ring. “Nate the Great’s” road to redemption starts Wednesday inside the Frank Erwin Special Events Center on the campus of the University of Texas.